I made big plans to complete my review of the Sony Xperia XZ1 phone in one post. Then daddy strolled home with an iPhone 8. That secret geek in me surfaced. I had to do THE camera #LAB-test - iPhone 8 versus Xperia XZ1 burst mode test. You can read all about it including my review of the Autofocus Burst Mode here. Have I been dying to get to this topic. XZs tickled my belly on super slow motion and now, XZ1 got my tail wagging on this brand spankin' new 3D scanning. Sony Mobile, stop teasing this old man already! Thank God I still have a strong heart. I have to clarify one thing. 3D imaging is NOT the same as 360° imaging. 'Tis was funny. While I was showing off this cool 3D scanning feature, I got the same response - "OH! Is it that 360-thing?" Click on Frodo's image above to view. As mentioned in part 1, even though I was forewarned about the difficulty of 3D scanning on dogs, I boldly took up the challenge. What's life without indulging in challenges? And you can't blame an old dog for loving new gadgets. Goes without saying, the first function I tested upon receiving my XZ1 was the 3D scanning. I was counting down the days to receiving the phone since Miss J showed me this exciting new function. In-built image crop function has limitations at this point i.e. the scan of Frodo, I am unable to crop to his silhouette. Avoid the 'shiny' - this includes shiny bald head (daddy) and spectacles (still daddy). Reflections causes the image to distort. Daddy ended up with crater head. *guffaw* Maybe I should buy a wig for daddy for Christmas. The sensitive light conditions - highly recommended by Sony Mobile to use soft lights. Outdoors with direct sunlight did not work. It did not scan. Indoors - I consistently get 'lighting condition' warning which can be annoying then one just becomes an expert at ignoring it. The scan works anyhow. Must keep still. Very very still. 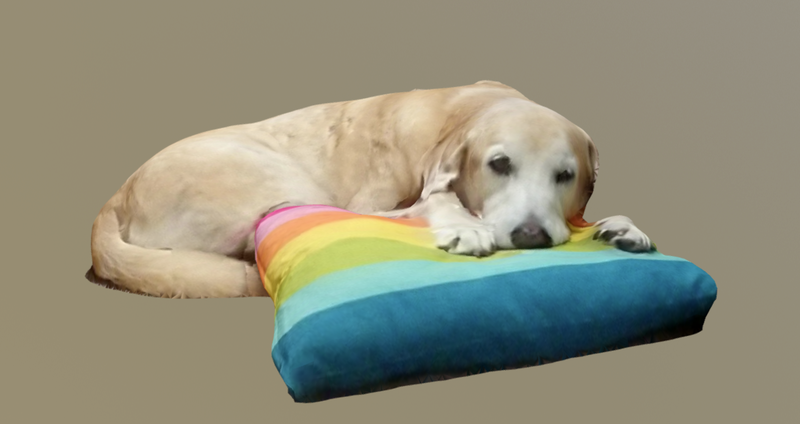 I spent many hours posing for mummy but my eternal love for her (my body and head may be still but my eyes follow her as she circles around me) resulted in unsuccessful scans. One side of the scan will always be good but the other side... Flapper-the-alien. Backing up of files is within the app. Manual back-up will require 'sharing' as a file and you can select where you want to send the file to. DO NOT DELETE before sharing/saving the file! 3D printing can only be executed with the existence of .obj file. Neither Facebook nor Instagram supports 3D images at this point. Need to use external app then share from there. Understand what kind of lighting condition works best. TIP: Personal favourite mode of scan: FREEFORM - This allows full body scan and more flexibility in scan directions. More challenging too! TIP: To achieve 3D scan with animals, best when it is sleeping. With 3D scanning capability added to this little gadget called a mobile phone, it is level up on one's mobile XPERIAnce. At this point, I have yet to send any of my 3D creation out to print but surely one of these days I would! 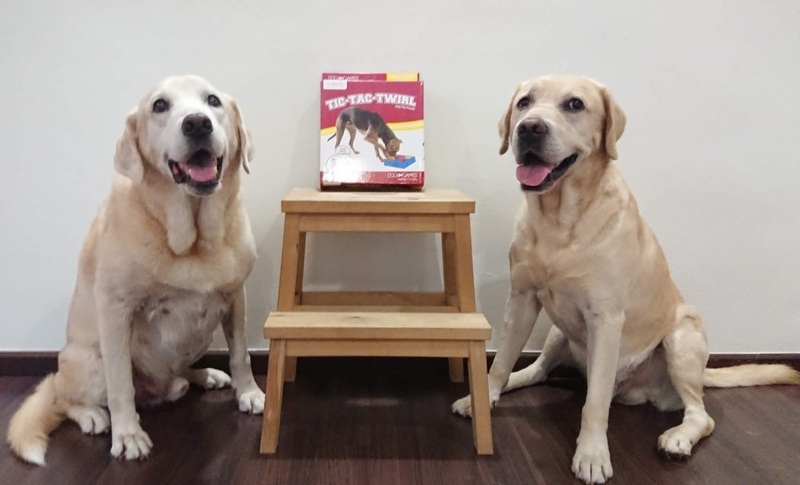 Gone are the days of just capturing life moments in 2D imagery but just the mere thought of creating little 3D memento tickles my furry belly. My Favourite 3D Scan - Bromance Moment! As I got a little more apt with my freeform 3D scanning skills, I decided to challenge myself to capture my bromance moment with Frodo. 3D scanning on one dog is tough enough but two! I think mummy is crazy. Crazy as crazy is/was, we achieve a successful scan if I may shamelessly say so! This, my friends, took me the longest time to master. To be exact, it took me 3 months before I managed a successful crop. To be fair, after my unsuccessful initial attempts at cropping these freeform images, I decided to focus on mastering the art of freeform scanning on the XZ1 first. One fine day in December, I decided to give cropping another shot and after much fiddling around, I finally managed my very first successful crop! Based on my previous attempts, I had sneaky suspicions Sony Mobile had updated the 3D Creator app and fine-tuned its cropping capability. Whether it was an update on the app or that sudden spark of ingenuity, I was well pleased that I - Flapper Choo - finally mastered the art of cropping. I can go fight the kingpin now. After my successful attempt with cropping my 3D model, I immediately contacted Sony Mobile to enquire about getting my 3D model printed. I was dying to see how the 3D print would turn out and perhaps own the bragging rights to show-and-tell! I was promptly recommended to contact MeMoment HK (Hong Kong). And then the nerves set in. What if the printer thinks my 3D scan was rubbish or a bad scan and I should not have it printed? But what the woof! I decided to give it a shot anyway and contacted MeMoment to get a price quote with a brief description of my fridge magnet idea since the back was flat (I was lying against the sofa). It is almost the best quality scan of pet by Sony Mobile that I have seen so far. Almost? I will take it anyway. I was delighted that the guy from MeMoment did not tell me my scan was rubbish and it was actually 'almost the best quality scan'. Good job me! Then came the price shock. So. For a tiny 3D model of 5.5cm long will cost me SGD170 (approx). That is just for the colour 3D printing cost without any customisation whatsoever. Holy Dog! There goes my show-and-tell model. To cheer myself up, I went to snoop at MeMoment HK Facebook Page and holy dog again! They do very very VERY impressive 3D print dog models. My paws could not resist but drop them another line to ask how they do it since I cannot even get a successful one of myself sitting still... with only my eyes discreetly following mama. Those are from our own developed 3D imaging system which has 30+ synchronised cameras taking photos at the same time and then we compute the 3D from the selected set of photo. Using Sony type of hand held scanner is impossible to scan kids or pet well as they are always moving. Thank you MeMoment for answering my question! I am no 3D scanning expert so this helps my understanding about the limitations with the handheld phone. I wish Frodo and I could fly over to Hong Kong now to get a 3D scan done of us! Maybe one day when mummy feels generous enough, I may finally get my very own show-and-tell model. If there's one good reason for getting the Sony Xperia XZ1 phone, it is this 3D scanning feature. Yes. It's got room for improvement - stability of app while scanning and the scan-sensitivity (lighting and reflections) - but it the XZ1 is only but a mobile device! For what we were able to accomplish, 3D Creator is impressive. Very impressive. 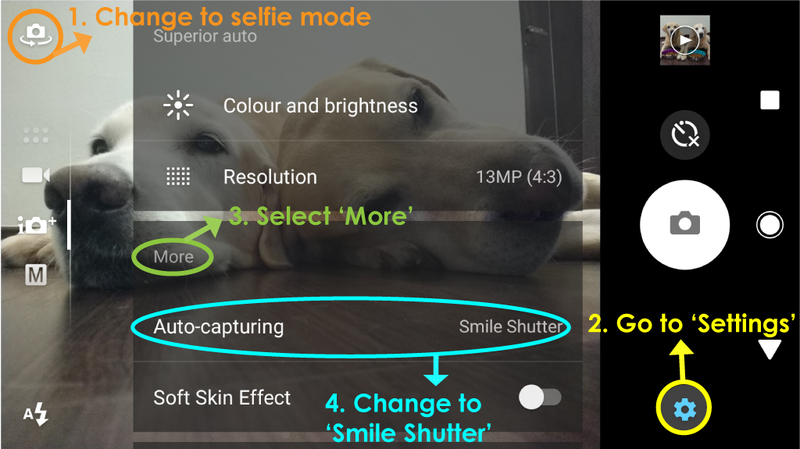 For selfie addicts, you may like this function very much. It is quite self-explanatory. Smile (or don't smile), the SZ1 is able to track and capture. I, the dog, do not use it very much but just once in while, when I MUST capture that selfie moment, it comes in very handy. Or should I say pawdy? Smile capturing while on a hot Valentine's Day date. Or when you've had a fantastic day out and you want to capture the moment. 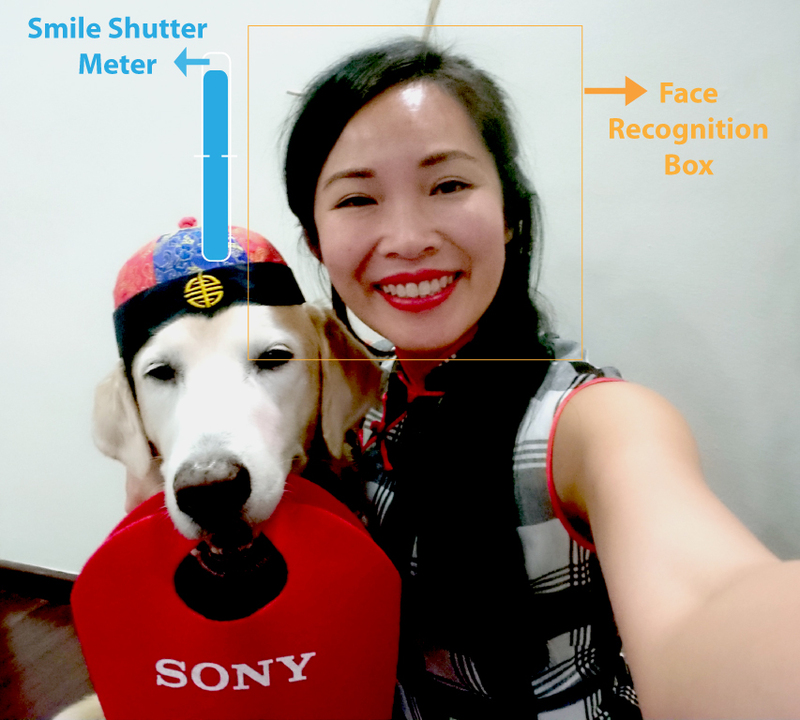 An illustration of how the smile shutter smartly recognises the face and there's a smile-o-meter. As the term says - 'Smile Shutter' so it is most sensitive to smiles. The bigger the smile, the better! I am not big on looking at the numbers on paper but am more a end-user experience type dog. The numbers are garbles to me. The boasts mean nothing. Use it and prove it, that's what I say. Before I got my very own Xperia XZ1, Sony Mobile Singapore passed me the XZ1 Compact to play around it aka test the Autofocus Burst function (see part 1 of this review). And because I had the privilege to own the XZs and XZ1 plus test the XZ1 Compact, my whiskers alerted me that maybe I should do a bit of a geeky review. Both the Xperia XZ1 and XZ1 compact has upgraded to Qualcomm Snapdragon 835, which is what Premium is on, whereas XZs is running on 820. Honestly, these are just numbers to me and in terms of actual usage, I do not necessarily feel the significant difference (in terms of speed) between the XZ1 and XZs. Perhaps I am not just not very sensitive to it. I honestly never thought much about phone processors till I started on this Xperia journey. I must say though, I only experienced the difference while helping Grandpa to transition from his android-phone-that-shalt-not-be-named to the XZs. That was when I truly realized, "Damn! My Xperia phone is fast!"... never mind that brand of phone always boasts of the newest and most impressive specifications at a much cheaper price. As much as I talk about the importance of a phone's camera capability, I do secretly rate a phone base on its battery life. Both XZ1s are using 2700mAh battery with smart stamina 3.0 while the XZs is using 2900mAh battery with smart stamina. Okay okay, the Premium is using 3230mAh battery with smart stamina. The numbers still mean nothing to me. Verdict: Compact wins hands down. Tadah! Anywoof, the battery life does seem to last longer on the Compact even with the heavy use of the camera (photos and videos) for an hour - approximately 20% of the battery life. I got pretty spoiled by the battery life of the Compact so I THOUGHT the XZ1 should be just as good, if not better. Two days into owning the XZ1 and I could not decide if the battery life is better, worse or same with the XZs. I have yet to test both phones on similar capacity though it may be tilted now because the XZs is about six months older. Conclusively, anyone looking for a compact phone (think iPhone 5) with Sony Xperia's full boast-worthy camera functions and good battery life, the Compact is the way to go. XZ1 vs XZs - The XZ1 is that teeny bit slicker, teeny bit rounder, teeny bit lighter, teeny bit bigger yet that teeny bit slimmer compared to the XZs. It is also that teeny bit more slippery to hold. Aye aye. On the first day of owning the XZ1, I could hear mummy screaming, "Flapper! Save the phone!". Three times. Fortunately with my lightning response and catch skills, I saved the phone from crashing to the ground. Sony Mobile is proud of their design consistency which also means that if anyone is looking to be thrilled by some groundbreaking revolutionary new Xperia design, it ain't gonna happen any time soon, I think. Both the XZs and XZ1 pretty much looks the same but it does have slight different in paw feel. This is something one has to test/try. I cannot woof it into words. 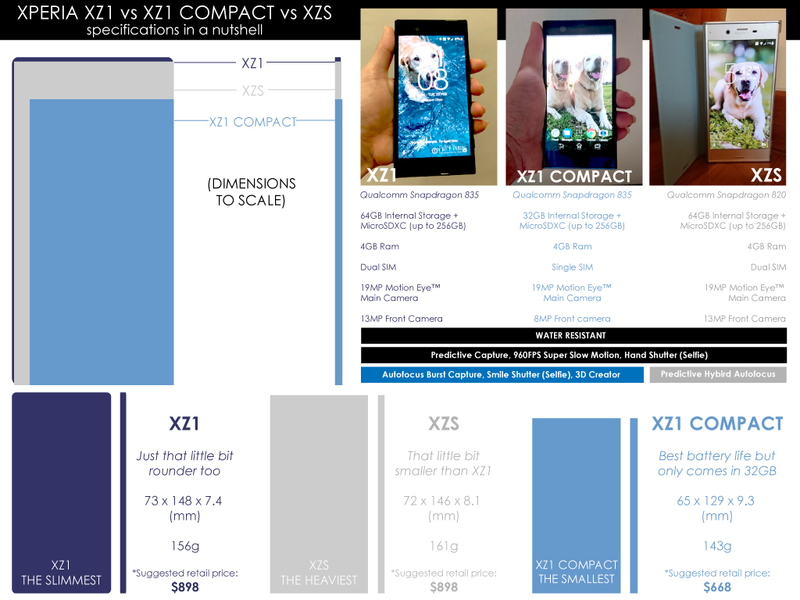 In the spirit of being a geek (a bit), I decided to pull together an illustrative comparative chart to layout the basic specifications of the XZ1 versus XZ1 Compact versus versus XZS to get a dog's eye view of what the phones are really about. Do I get a paw-5 for creating this fabulous chart? *For latest prices and promotions in Singapore, please refer to Sony Mobile Singapore's Microsite OR Lazada SG. I am sure that the price for the XZs, being the predecessor to the XZ1, would have dropped by now. Alternatively, do check your mobile service provider on their prices. For one tiny device called a mobile phone, the camera technology is amazing, it has been quite problem-free and the ease of use is a huge plus. The Sony XPERIAnce has been spectacular so far. I truly love my phone. The Xperia XZ1, at first snoop, was nothing to rave about - so the online reviews said. The main reason for its lacklustre prelaunch reviews was that specifications wise, the key difference from the XZs was its processor but that also meant it was on par with the XZ Premium. The newbie to XZ1 was 3D Creator, Autofocus Burst Capture and Smile Shutter which has now been added to the XZ Premium as well. The XZ1 also boasts of improved sound quality and during their launch demo, the difference between the XZs and XZ1 was audible. This is great for anyone who listens to music while on the go or loves watching shows on their mobile device. Sony Mobile Singapore's presentation of the highly-impressive layers of the Xperia XZ1. Five months on since I started on the Xperia XZ1, I must honestly say that the so-called nothing-to-rave upgrades did enhance my end user experience. Sony Mobile has overcome the overheating issue and to date, I have yet to experience any problems in that department. Eleven months since I ditched my iPhone for the Xperia, I have not (believe it or not) missed my former phone one bit! I have truly enjoyed my Sony XPERIAnce thus far and have come to truly respect the technology that goes behind it. A great phone, it is. This has brought on classical conditioning response of drooling. Have I really become a bit of a dog-geek? Anywoof, I have no idea if I will get the privilege to continue my run but it has been such a pleasure and honour to go on this Sony XPERIAnce and capturing many of my life moments since March 2017 with the Xperia XZs and XZ1... predictively, autofocus-ly, low light-ly, underwater-ly, and super slow motion-ly. I have truly fallen in love with the Xperia phone!